Umer Khan, M., Waqas Bashir, M., Rehman, R., Ahmed Kiani, R. (2014). Frequency of ABO and Rh (D) Blood Groups Among Blood Donors in Lahore, Pakistan. International Journal of Advanced Biological and Biomedical Research, 2(3), 597-600. Muhammad Umer Khan; Muhammad Waqas Bashir; Raima Rehman; Rizwan Ahmed Kiani. "Frequency of ABO and Rh (D) Blood Groups Among Blood Donors in Lahore, Pakistan". 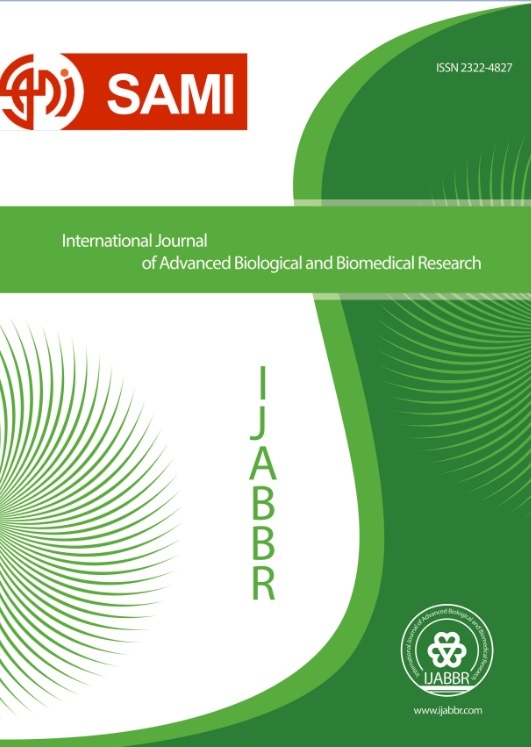 International Journal of Advanced Biological and Biomedical Research, 2, 3, 2014, 597-600. Umer Khan, M., Waqas Bashir, M., Rehman, R., Ahmed Kiani, R. (2014). 'Frequency of ABO and Rh (D) Blood Groups Among Blood Donors in Lahore, Pakistan', International Journal of Advanced Biological and Biomedical Research, 2(3), pp. 597-600. Umer Khan, M., Waqas Bashir, M., Rehman, R., Ahmed Kiani, R. Frequency of ABO and Rh (D) Blood Groups Among Blood Donors in Lahore, Pakistan. International Journal of Advanced Biological and Biomedical Research, 2014; 2(3): 597-600. The clinical significance of ABO and Rhesus blood group systems has been well documented. The objective of this study was to determine the frequency of ABO and Rhesus blood groups in blood donors in Lahore, Pakistan, with a view to generate data with multipurpose future practicalities in the field of medicine. Blood groups of 3000 blood donors were determined by commercially available standard monoclonal antisera by tube agglutination technique. Out of 3000 donors, 92.2% were males and 0.8% were females. The most frequent ABO blood group present was B (37.8 %) followed by O (28.8%), A (24.2%) and AB (9.1%) in blood donors; while in Rhesus system 93.0% were Rh+ve and 7.0% were .Rh-ve . The most important implementation of such studies is in management of blood banks and transfusion services. Canadian Blood Services - Société canadienne du sang. "Types & Rh System, Canadian Blood Services". Retrieved 2010-11-19. Dacie and Lewis 2006. Practical haematology, 10th ed, Churchill Livingstone, Philadelphia. Dennis LY, Hjlem NM, Fidler C (1998). Prenatal diagnosis of fetal Rh D status by molecular analysis of maternal plasma. N Engl J Med.;339:1734–8. [PubMed]. Ghasemi N, Ayatollah J, Zadehrahmani M et al. Frequency of ABO and Rh blood groups in middle school studies of Yazd Province. Iranian Journal of pediatric Hematology and Oncology Voll.No1. Khaliq MA, Khan JA, Shah H, Khan SP (1984). Frequency of ABO and Rh (D) blood groups in Hazara division (Abbottabad). Pak J Med Res. 23:102-3. Khan MS, Subhan F, Tahir F, Kazi BM, Dil AS, Sultan S, Deepa F, Khan F , Sheikh MA (2004). Prevalence of Blood groups & Rh factor in Bannu (NWFP) Pakistan. Pak J Med Res. 3:8-10. Khurshid B, Naz M, Hassan M, Mabood SF (1992). Frequency of ABO and Rh (D) blood groups in district Sawabi NWFP Pakistan. J Sci Tech Univ. Peshawar; 16:5–6. Laura D (2005). Blood Groups and Red Cell Antigens. Bethesda (MD): National Center for Biotechnology Information, U.S URL http://www.ncbi.nlm.nih.gov/books/NBK2277/. Manual of Normal Parameters of the health. Peshawar. Pakistan Medical Research Council, Islamabad: 1984, pp. 79-81. Rahman M and Lodhi Y (2004). Frequency of ABO and Rhesus blood groups in blood donors in Punjab. Pak J Med Sci; 20:315–8. Shamim A, Hafeez MA, Ahmad MM (2002). ABO and Rh blood groups I: Markers of cardiovascular risk and association with lipids and other related risk covariables in a Pakistani population. Proc Pak Acad Sci. 39:47-66. Sigmon JM (1992). Basic principles of the ABO and Rh blood group systems for hemapheresis practitioners. Journal of clinical apheresis, 7(3):158–62. Talib VH (1991). Handbook of medical laboratory technology.2nd edition. New Delhi: CBS publisher "Table of blood group systems". International Society of Blood Transfusion (ISBT). Oct 2008, URL:http://ibgrl.blood.co.uk/isbt. Yousaf M, Yousaf N, Zahid A (1988). Pattern of ABO and Rh (D) Blood groups distribution in Bahawalpur Division. Pak J Med Res. 27:40-41.